The entry portal in the center of the façade facing Constitution Avenue opens to a neoclassical foyer with walls of Caen stone, a creamy-yellow, fossil-rich limestone that is quarried in northwestern France. 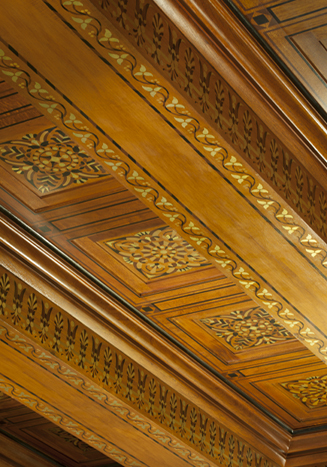 The mahogany ceiling is decorated with a silver vine design. Four bronze lamps, designed by Lawrie to suggest the fire-bearing bowls that illuminated Greek temples, line the walls. Bronze winged figures, mounted on either side of the foyer, originally flanked a moveable stage for the Great Hall. 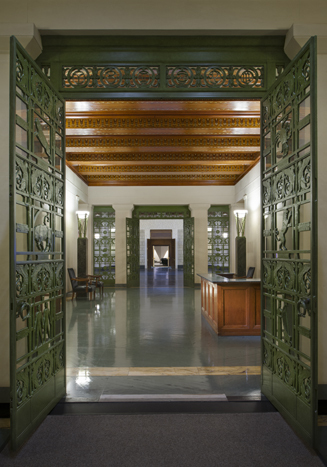 Constitution Avenue Foyer after restoration. © 2012 Maxwell MacKenzie. Ceiling of the Constitution Avenue Foyer. © 2012 Maxwell MacKenzie.